After a three year sabbatical it is great to be back once more setting up our stand at the Chelsea Flower Show - seeing show gardens grow from holes in the ground to the greatest temporary horticultural statements anywhere in the World, truly is a site to behold. For me personally it has been great to catch up with friends that have, like me, been doing this for nearly on 30 years now! If you have a ticket please do pop along to our modest stand situated just behind the Morgan Stanley garden - sorry, I don't even know the name of it yet! Ours is No. 34 Pavilion Way. 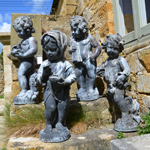 To latest stock various - no themes this time so to Statuary and Sculpture first. We are displaying, amongst other items at Chelsea, this super set of early 20th century lead Four Seasons, resplendent with attributes and cherubic features, alongside a pair of characterful mythical creatures in the form stone Griffins, again early 20th century. A leap forward in date now to a bronze maquette by David Wynne (1926 - 2014) who is best known to all for his famous Boy with Dolphin sculpture which sits not half a mile from Chelsea on Cheyne Walk. This Wynne figure is of the river god Tyne and cast in 1966 predates by a couple of years the enormous version which graces the Civic Centre in Newcastle upon Tyne. Going back in time one can see how this figure is much influenced by Giambologna's great Appennine Colossus in the gardens of the lost Villa di Pratolino near Florence, a garden I have promised myself to visit one day. Seats here are in the form of one Regency games seat - so called because you can move them about on their wheels from Tennis to Croquet lawn, and another quirky little stone seat with a pierced wrought iron back. Keeping with metal work we have a wonderful pair of decorative ironwork gates replete with floral decoration and, most usefully, hinges to go straight into that space between two garden rooms perhaps..
Planters new - we now are back holding stock of this wonderfully decorative Arts and Crafts style planter, which was first produced by the Bromsgrove School. 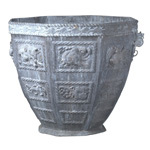 Planters old - a fine example of the work of Mr James Marriott Blashfield in the form of this large tazza urn on plinth - fully stamped, this centre piece is both the best of British 19th century terracotta and a fine rare example for a collector. 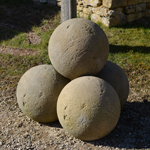 And to end, it's a pile of cannon balls or should I say a stack of our large spheres made into what can be seen as a formal garden statement or a deterrent to the most determined verge transgressor! I wish you well and look forward to saying Hi on our Chelsea Show stand if you are passing by next week.